With headphones, it’s not just about the sound quality. There is so much more that makes a good pair, and it starts the moment you open the box. To be truly excellent, a pair of headphones has to impress from the very start, delivering an experience that is excellent at every step of the way. German headphone supremos, Beyerdynamic, understand this. Their Amiron Home headphones are, quite simply, the most comfortable pair of headphones we’ve ever worn. In this review, we break down the Amiron Homes’ sound, design, comfort and fit, packaging and accessories, specs and more. To see how it stacks up, read our list of the best high-end headphones. Perfect clamping pressure and velvety pads are all well and good - and we’ll get to that in a minute - but they don’t mean a damn thing if the sound isn’t up to scratch. Fortunately, that’s not a problem with the Beyerdynamic Amiron Home headphones. Beyer’s cans are known for their neutrality – so much so that many professional studios often use them to check songs mixes. While that’s probably not going to happen with the Amiron Homes, there’s no question that they have the same sound signature. Overall, you’re looking at a neutral, balanced portrayal of your sound, with just enough character and verve to keep you coming back. There is no bias towards any particular part of the frequency spectrum. Bass is powerful and clear without being overbearing, and the mids are cool and straightforward. There’s no sense of stripping the music bare that you get with so many other reference-grade headphones – we played several low-quality MP3 files through these cans, and they didn’t seem at pains to point out that we were listening to compressed material. At 250 ohms, they aren’t going to be happy running off a smartphone, although the 3.5mm jack (adaptable to 6.3mm) certainly allows for that; couple them to a decent amplifier, and they absolutely sing. By the way, since they’re open-back, you do need to be aware of bleed - even if it’s nowhere near as bad as other examples, like Grados. 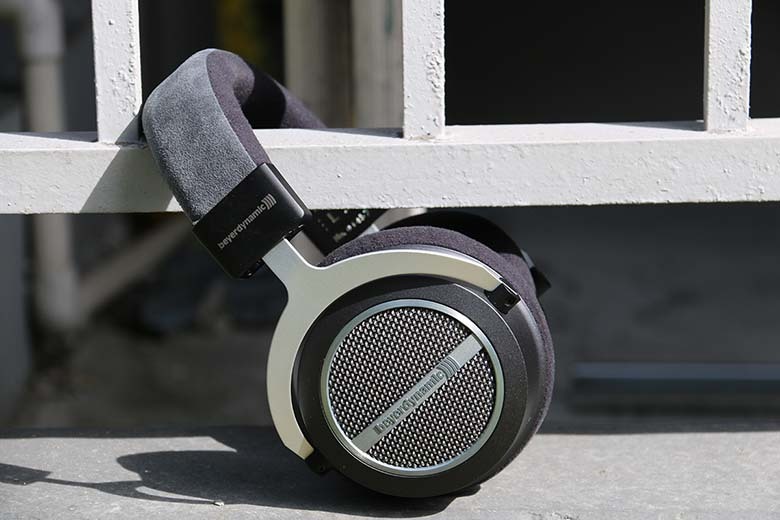 They felt forgiving and natural, which we really liked, reminding us of the smooth sound of the HiFiMAN HE1000 V2. Given that those cost just under $3,000, compared to $599 for the Amiron Homes, that’s quite a compliment. And on the opposite end of the spectrum, good-quality sound files like Spotify Premium or CDs sounded absolutely gorgeous, the headphones framing the music without overly adding to it, accentuating its qualities and then getting out the way. Ultimately, you’d go for these cans not only for their next-level comfort, but also when you enjoy music that is uncolored by headphones, and served up in as natural a manner as possible. We loved how tight the dynamics were, and how much clarity the headphones gave to even the smallest elements of a track. If we had one criticism, it’s that the highs, while detailed, sometimes felt a tiny bit harsh – nothing that would cause us to quit listening, but just something we would have liked to be a bit smoother. A speck of dust on the perfect frame, if you like. But although they aren’t as exciting as other headphones, we’d quite happily put them up against anything in their price range. Perhaps the best comparison would be something like the Audio-Technica ATH-W1000Z, which offers similar clarity and functionality at a slightly lower price ($400, compared to the Amiron’s $599). All the same, we much prefer these, which are much more complete headphone experience. They are going to compete with the truly big dogs in the open back world, like AUDEZE, but that doesn’t stop them from sounding terrific. It’s worth taking a second just to look at what these headphones are made of. Even if they didn’t wow us with how good they felt, there’s no question that they are very pretty indeed. Beyerdynamic have always had a design ethos that walks the line between industrial and attractive, with muted, often drab grey and black color schemes matched with smooth curves and swooping accents. For the Amiron Home, a pair of sizeable over-ear, open-back cans, this is very much the case. The cups might be made of plastic, but they feel rock-solid, and what dominates the outer housing is a circular, tightly-woven grille with a broad metal stripe across each side that houses an embossed logo. It not only looks great, but it feels great, too; run your thumb across it, and it’s easy to see just how much thought and concerted application has gone into the design. Match these up with a classic, like the DT770 Pros, and you can see the design lineage going all the way back. While it’s probably not going to appeal to everyone, it’s an aesthetic that we really enjoy. There are three things that make these headphones the most comfortable on earth. The first is the weight. The Amiron Homes weigh 12 ounces. Objectively, not very much less than something like the similarly-shaped Fostex TH610s - a pair we have in for review at the moment - and which weigh 13 ounces. It’s not particularly heavy, but all the same, we couldn’t help feeling that these headphones were just…light. There really is no other way to put it. Holding them, they feel almost weightless. The second thing – and it leads on directly from the first – is the clamping pressure. This is such a small thing, but if it’s off, it can ruin the whole experience. Too loose on your skull, and the whole kit and caboodle slides off the moment you tilt your head. Too tight, and it can stop you listening to your brand-new headphones for longer than an hour, which is the most deeply annoying kind of problem to have. And yet, as important as it is, it’s incredibly tricky to get right. Since everyone has a different size noggin, getting a particular type of material to have just the right amount of flex and torsion in all circumstances is crazy difficult. Somehow, Beyer have managed it. The clamping pressure of the Amiron Homes is perfect. Really, there’s not much more we can say to add to that. Compare it to something like the Audeze EL-8 Titaniums - a pair of high-end closed-back headphones which retail for around $400 and which we review here - and it’s apples and oranges. The third thing is the microvelour. It’s what the cups and headband are covered with, and it is perfect. As lush and soft and rich as a pair of silk sheets. If there’s a better material to have against your head - and this includes leather - we haven’t found it. It. Is. Perfect. In terms of comfort and fit, the Amiron Home headphones do everything right and nothing wrong. They are just phenomenal. It’s just as well that you aren’t going to be using these for smartphone listening. Having to tote around a damn-near ten foot cable would get old fast. Admittedly, it’s a well-built cable, two strand, with a 3.5mm jack at one end that can be adapted into a 6.3mm one with the included plug. It’s just very long. Outside of that, the only accessory you get is a fairly bog-standard, rigid, zippered case. While this does the job of holding and protecting the headphones, its black surface attracts dust, and the tiny pouch on the inside is simply insufficient to hold the cable when it’s detached. It has similar problems to the case that came with the old Sennheiser HD1s (full review here), which was also a magnet for dust. Those headphones, by the way, are excellent - if you want a wireless option, check them out. They’re cheaper, too, at $245 to the Amiron Homes’ $599. All the accessories work reasonably well, but we can’t help feeling that, in this case, Beyerdynamic went a little bit too far onto the industrial side of things. The packaging is fairly standard, too, with a simple cardboard box that gets the job done without being ostentatious. At this price range – $600 or so – it’s almost a little disappointing to see that the packaging and accessories are little more than ticking boxes. Still, when the actual headphones themselves are this good, it’s not a deal breaker. The Beyerdynamic Amiron Home headphones are the comfiest headphones ever made. The build quality of the Amirons is superb, and they genuinely feel luxurious. ​The headphones offer neutral, clear, dynamic sound that raises the bar for other models. The accessories are a little middling, and we think Beyer could have done better. The earcups of the Amiron Home headphones can be tough to remove. ​The cable is very long - perhaps a little longer than strictly necessary - although it is fully removable. Although they are closed-back, the Audio-Technica ATH-W1000Z cans do a very good job at competing with the sound of the Amiron Homes – and at a lower price point. While the audio quality might not be right up there with the Beyerdynamics, it’s refined and elegant enough to warrant a second look. The design is a little more sensual, too, with teak ear-cups and leather pads. The comfort level is nowhere near that of the Beyers, but this is an aesthetic that will probably hold wider appeal. Go check them out. They are about $200 cheaper, too. Then there’s the classic AKG K712. We finally had a chance to hear these headphones – for whatever reason, a pair had eluded us – and we really liked them. They sound neutral and natural, and are particularly good at articulating vocals. While this makes them a little more specialised than the Beyers, it definitely means they are a worthy alternative. The huge cups and design may not appeal to everyone, but the comfort level is good. We really like the orange accents too, which set the headphones apart from the competition. At $399, they are pretty much the same price as the ATH-W1000Z cans mentioned above, and about $200 less than the Amiron Homes. If warm, lush bass is more your thing, may we suggest a pair of AUDEZE LCD2C? While slightly more expensive than the $599 Beyerdynamics, at $799, and not quite as comfy, they reward you with some genuinely brilliant low-end. The soundstage is better, too, thanks to the planar dynamic drivers. We adore these headphones, and while they aren’t as neutral as the Beyers, they remain excellent. Beyer offer plenty of other headphones too - try the Beyerdynamic DT1990 Pro. At an identical price to the Amiron Homes, and with similar specs, you might reasonably wonder why we offer these as an alternative. They don’t have the comfort level or aesthetics, but what they lack in design, they make up for in pinpoint precise sound. These are the headphones you go for if you want absolutely nothing getting in the way of your music – if you want to analyse it exactly as it’s presented. These are also ideal if you’re actually making music, and looking to check mixes using headphones. They aren’t nearly as much fun as the Amiron Homes, but they are still bloody good - and are actually slightly cheaper, at around $580, depending where you buy.